Now that that's out of the way, we can talk about polish! Yesterday after I had already had my daily dose of polishing, a package came. 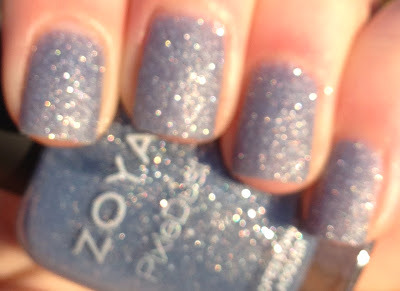 And it was from Zoya! Finally! I ordered my free polishes before the promotion officially started, but I expected it to take a while to ship because I got Nyx from the new PixieDust collection, which wasn't technically supposed to be released until February 1. So of course, I had to take my polish off right away so I could try out Nyx. And I love it!! Click on the link below for swatches and a review! Not gonna lie, the textured finish intimidated me a bit before I tried the polish. I thought it might be hard to apply, and that the texture would be too rough for my liking. But I was definitely wrong. Application was super easy. Zoya recommends not using base coat or top coat, so I followed their suggestion. I applied 3 thin coats of Nyx and waited about 3 minutes in between each coat to make sure it was dry before applying the next coat. The formula flowed nicely and was very easy to work with. After 2 coats, the color build-up wasn't quite there yet, so I added a thicker 3rd coat, and that pretty much sealed the deal. Like most matte polishes, Nyx dried pretty fast. I was using my hands again for normal daily activities in less than 10 minutes! I'm glad I chose Nyx. It's a really pretty and unique periwinkle color with strong grey undertones. In indoor light, the polish actually looks like a medium grey color. In the sun, the blue tones are more dominant. And the sparkle!! 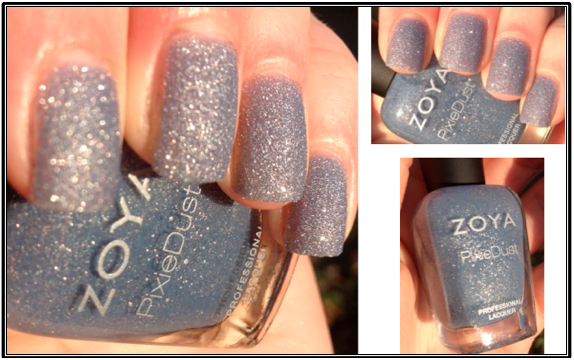 Nyx contains a lot of silver glitter that makes the polish sparkly in any type of light, especially in the sun. I really love the finish too. 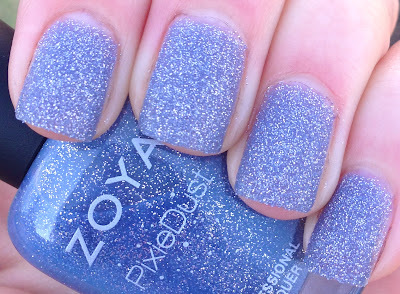 The combination of matte + sparkle = amazing, it kind of looks like sparkling sand. 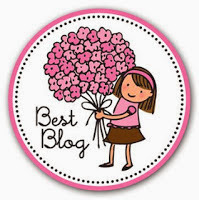 It's really interesting and unique, which I always love! I honestly can't stop admiring my nails. Lastly, the texture isn't rough or gritty at all. The glitter is really really fine, so the texture doesn't interfere with anything. I can't really describe it, but as an example, I can rub my nails on my skin without scratching myself and the polish doesn't get caught on anything like I thought it might. So now on to the pictures. I've included a lot of pictures here because I really wanted to capture the essence of Nyx. All photos are 3 coats. Intentionally blurry to show the sparkle. 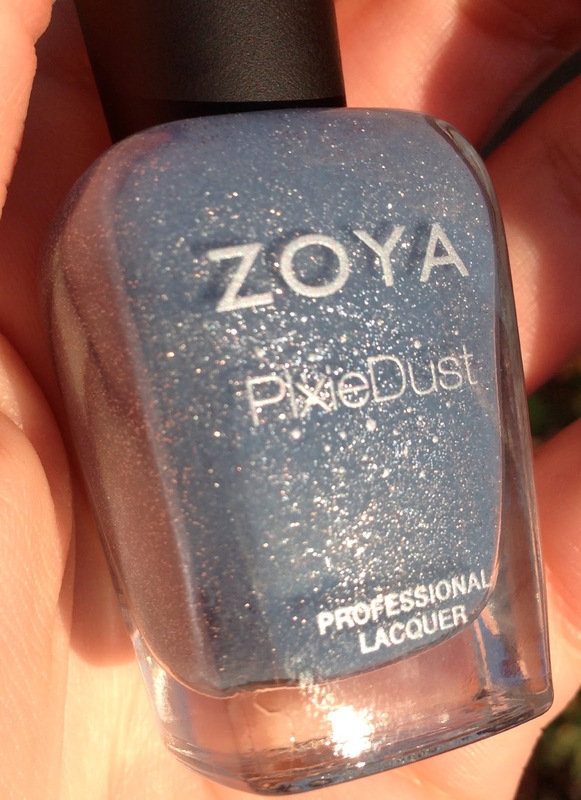 I only ordered one shade from the PixieDust collection because I wasn't sure how I would like the textured finish. But now that I've tried it, I'll have to at least get Godiva too. The swatches I've seen of it are gorgeous! So what do you guys think? Are you into the new textured polishes that are popping up for spring? Have you tried any of them? 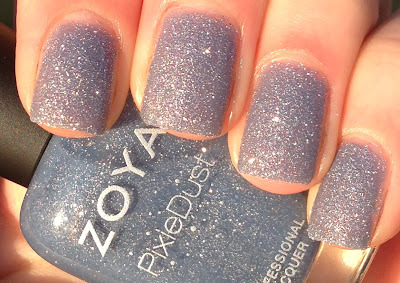 I haven't tried any of the new polishes from the pixie dust collection because I'm not sure how I feel about the current "textured" trend.. Do you have any other textures? I really can't make my mind up! This is the only one I've tried, but I actually love it! It's not gritty or rough like some other textured polishes I've seen and the matte/sparkly combo is amazing! I'm really curious about this collection. Candy Cane Nails: Better Late Than Never!